Back in the 1970’s, I had a Holly Hobbie rag doll. Recently, while reminiscing, I recalled the clothing and immediately knew I had to make a prairie, pioneer style bonnet like the one she wore. 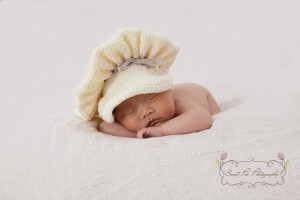 The bonnet is designed to fit a 35 cm (14”) head making it perfect as a newborn photo prop. Included, to finish the ensemble, are a dinky pair of ‘simple’ legwarmers. YOU WILL NEED 250 m of DK yarn (light Aran/WW will also work if you take care with gauge), a 3.50 mm hook, one stitch marker, a 1 m/yd length of ribbon and a needle for neatening ends. GAUGE: 9sts and 10 rows to 5 cm (2”) in UK dc – measured across peak. This pattern is written in UK terms with a table of US equivalents provided as applicable. This pattern has been fully tested. 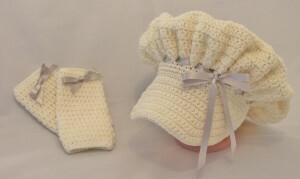 This entry was posted in Crochet, Photo Props on January 31, 2014 by Thomasina Cummings.